Wool Road Bridge No 70 is a minor waterways place minor waterways place place on the waterways major waterways place village town city on the Huddersfield Narrow Canal between Royal George Aqueduct (2 miles and 6 furlongs and 6 locks to the southwest) and Diggle (1 mile and 7 furlongs and 9 locks to the northeast). The nearest place in the direction of Royal George Aqueduct is Wool Road Winding Hole (Non tunnel traffic wind here); ¾ furlongs away. The nearest place in the direction of Diggle is Old Lane Bridge; ¼ furlongs away. Station Rd, Oldham, OL3 6HQ — 1362 yards to the south. Saddleworth — 1158 yards to the south. 1 The Square, Oldham, OL3 5AA — 420 yards to the west. Running Hill Gate, Oldham, OL3 6LW — 1286 yards to the east. 21-23 Wool Road, Oldham, OL35 — 78 yards to the northeast. Gatehead Business Park, Delph New Rd, Delph, Oldham, OL3 5DE — 1271 yards to the northwest. Civic Hall,Lee Street,Uppermill, Oldham, OL3 6AE — 1061 yards to the south. 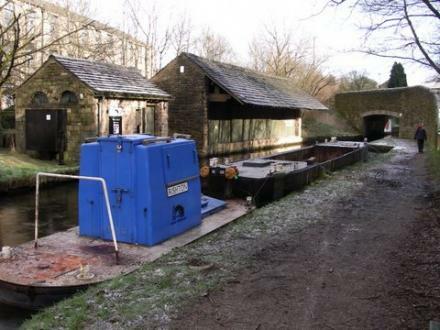 Gatehead Mill, Delph New Rd, Delph, Saddleworth, OL3 5DB — 1357 yards to the northwest. 73 High Street, Uppermill, Oldham, OL3 6AP — 937 yards to the south. Greenfield, OL3 6AE — 1059 yards to the south. 18 Platt Ln, Whitchurch — 552 yards to the west. Huddersfield Rd, Delph, OL3 5 — 1428 yards to the northwest. Ladcastle Road Uppermill, Saddleworth, OL3 6LT — 1052 yards to the southeast. Wool Road, Oldham, OL3 5PB — 294 yards to the south. 13 New Street, Uppermill, Manchester, OL3 6AU — 949 yards to the south. Unit 5 Warth Mill, Huddersfield Road, Diggle, Saddleworth, Oldham, Oldham, OL3 5PJ — 1488 yards to the northeast. Unit 5, Anchor Business Park, Oldham, OL9 6AZ — 1286 yards to the northwest. Oldham, OL3 5 — 1582 yards to the west. 4 Court Street Uppermill, Oldham, OL36 — 1045 yards to the south. Delph New Rd, Oldham, OL3 5DE — 1270 yards to the northwest. 5 Ward Lane, Oldham, OL3 5JT — 1309 yards to the northeast. Manchester — 926 yards to the southeast. New Delph — 1438 yards to the northwest. Dobcross Holy Trinity Primary School, Oldham, OL3 5BP — 219 yards to the southwest. Wool Lane, Oldham, OL3 5PB — 282 yards to the south. 23 High Street, Saddleworth, OL3 6HS — 1212 yards to the south. Running Hill Farm, Oldham, OL3 5JS — 1413 yards to the east. Dobcross, Oldham, OL35AJ — 223 yards to the northeast. 481 yards to the west. Saddleworth Business Centre, Huddersfield Road, Delph, OL3 5DF — 1344 yards to the northwest. Huddersfield Road, Saddleworth, OL35DF — 1375 yards to the northwest. Saddleworth, Manchester — 1574 yards to the northeast. Unit 3.15 Saddleworth Bus Centre, Huddersfield Road,, Manchester, OL3 5DF — 1342 yards to the northwest. Diggle, Saddleworth — 1568 yards to the northeast. 62 Dobcross New Road, Manchester, OL3 5NP — 288 yards to the southwest. Units 3-5, 45 High Street, Oldham, OL3 6HS — 1033 yards to the south. Oldham — 960 yards to the south. unit 12 gatehead Mill Delph New Road, Delph, OL3 5DB — 1324 yards to the northwest. Manchester, OL3 6 — 926 yards to the southeast. Albion Shop & Cafe, Oldham Road, Delph, Saddleworth, OL3 5RQ — 1052 yards to the southeast. 163 yards to the northeast.